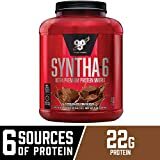 BSN Syntha-6 is a synchronized scientific blend of six natural protein sources purposely designed to be a sustainable time released protein blend. What does this mean? Each protein source was specifically chosen for its absorption rate. The synchronized blend allows for protein utilization throughout different times of the day. BSN Syntha-6 contains six protein sources as suggested in its name and has a growing reputation as the best tasting protein powder on the market since 2008. It contains whey protein concentrate [milk], whey protein isolate [milk], calcium caseinate, micellar casein, milk protein isolate and Egg Albumen [Egg]. A 2.91 lb. tub can be found on Amazon for $32.9 and a 5 lb. tub for $49.59. The unique profile of proteins each with a very specific absorption & digestion rate and amino acid profile provides the essential building blocks for producing lean muscle mass within a balanced weightlifting regime. It is also suitable as a meal replacement choice, because it contains both the addition of fiber and a fat mixture of MCTs and EFAs. Calcium and micellar casein are included in the formulation to balance digestion & absorption rates. BCAA are branch chain amino acids and are known for their anticatabolic muscle saving characteristics. 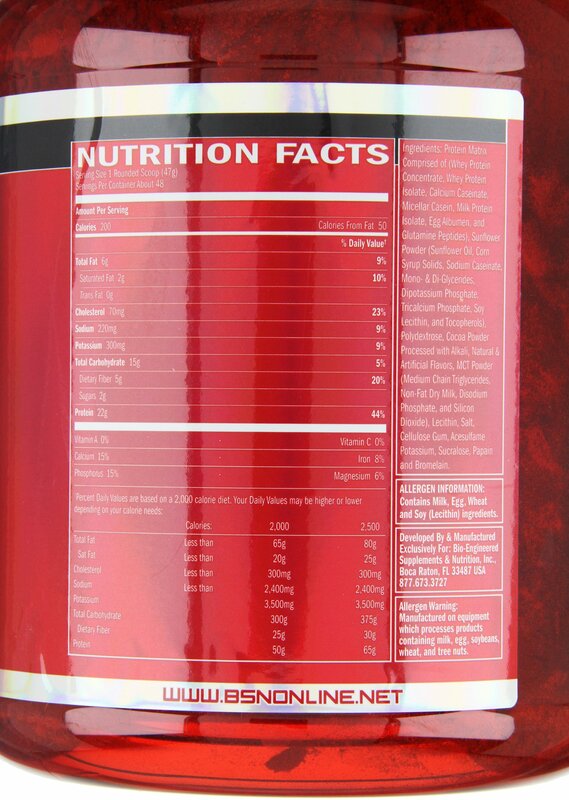 BSN Syntha-6 formulation provides a superior balance of BCAA within its 6 protein blend formulation. Glutamine peptides are a conditional essential amino acid, which means that your body can produce glutamine peptides. Glutamine peptides are glutamine molecules that are bonded to other amino acids and are known to increase the level of glutamine in your body once ingested. Increased levels of glutamine can support muscle and tissue repair after intense workouts, injury or surgery. The inclusion of bioactive digestive enzymes Papain and Aminogen are designed to help with protein break down and digestion reducing stomach upset, such as gas and bloating. The blend is soy free which also helps reduce stomach upset and bloating. The taste, can BSN Syntha-6 be considered the best tasting protein powder on the market today? Yes, this blend is simply beyond tasty. It provides for maximum muscle development while delivering a wonderful diversity of flavors. One may be tempted to refer to it as a smoothie and frequently utilize it as a meal replacement. Although it can be easily mixed with water in a shaker bottle, the use of a quick blend with a cup of milk (fat free or 2 percent as well as Almond Milk) can increase the taste factor and sensation that one is drinking a smoothie. The fiber content is very filling when on the go and fast food is not a healthy food choice. The use of almond mild may be helpful for those with lactose tolerance issues. The most important aspect of Syntha-6 is its ability to safely supply protein to the body over a six hour period. 22 grams of bioavailable essential amino acids with BCAA that provide lean muscle mass development. It provides a thick and creamy matrix that goes down like a real smoothie and not just any muscle tech protein drink. Although BSN Syntha-6 does not contain aspartame it does contain corn syrup and corn syrup solids that may affect those with corn allergies. The use of a protein supplement once or twice a day is optimal. Some may be tempted to consume it more frequently for a healthy snack alternative, most will find no issues but some may find some upset due to increased protein ingestion. Moccachino tends to come out on top in taste preference; the use of milk with the vanilla flavor may not satisfy vanilla lovers. Those who love their milk may experience increased gassiness. It does not mix will with just a simple stir technique, best with shaker or mixer. With a 200 calorie count it has 60 more calories than Optimum Nutrition Gold and may be best suited as a blend for bulking up. It is higher in carbs than some comparable brands which add to the meal replacement qualities and taste. The blend contains artificial flavors and higher sugar grams as a result of the added carbs and use of corn syrup. Overall Syntha-6 is impressive. It provides a delicious way for those who need to consume a high level of essential amino acids. Eliminating the need to force feed your body chalky or grainy protein drinks. Instead it delivers 22 grams of protein at 200 calories per serving. Syntha-6 provides increased digestibility with sustainable absorption over 6 hours with its 6 protein blend. A balance of BCAA that support efficient muscle and tissue repair after a strenuous workout or lifting regime. The addition of easily absorbable fiber increased the sensation of being full, while reducing bloating. MCTs and EFAs fat mixture makes it a great meal replacement for breakfast, lunch, or dinner and even an afternoon or bedtime snack. The addition of bioactive digestive enzymes sets BSN Syntha-6 apart from other protein drinks use only one source of plant based protein such as Sunwarrior or Vega One. BSN Syntha-6 is the best tasting protein blend available on the market today. It supports muscle development and tissue repair after intensive workouts. It provides a balanced meal replacement option and delivers the body protein throughout the course of a 6 hour period. It offers a flavor for every taste preference and is considered easily consumable.